As one of 20+ bloggers participating in the Thrift Store Decor Challenge, I am excited to show and tell you all about this this beautiful DIY deconstructed chair. Be still my heart, I am in love! Modern. Boho. Rustic. Industrial. Farmhouse. The beauty of a deconstructed chair is that it can fit in with just about any decor style. 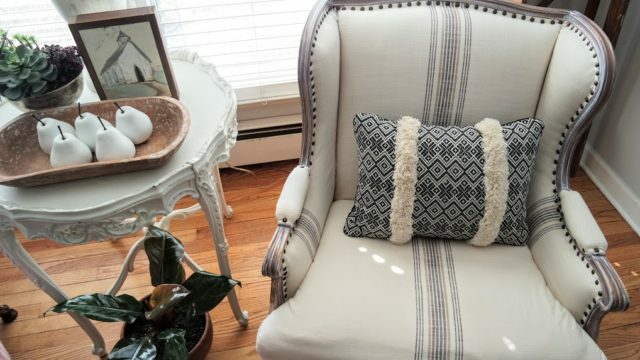 I adore the simplicity of this DIY deconstructed chair that I have added to my living room. Yes, deconstructed furniture is a “trend” right now but I hope it stays around for a very long time. I don’t know which aspect draws me to it but I love the artistic flare as well as the industrial vibe it gives off. 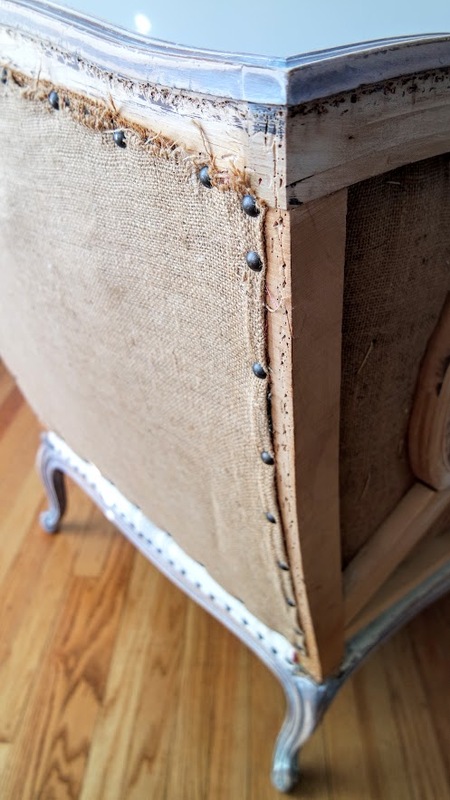 I have been anxious to try my hand at deconstructing a piece of furniture but I have seen some horrible, disgusting projects that had me a bit hesitant. I was lucky to be gifted two identical chairs covered in a pink plaid fabric. They were very cute with sturdy bones but pink is not my color. 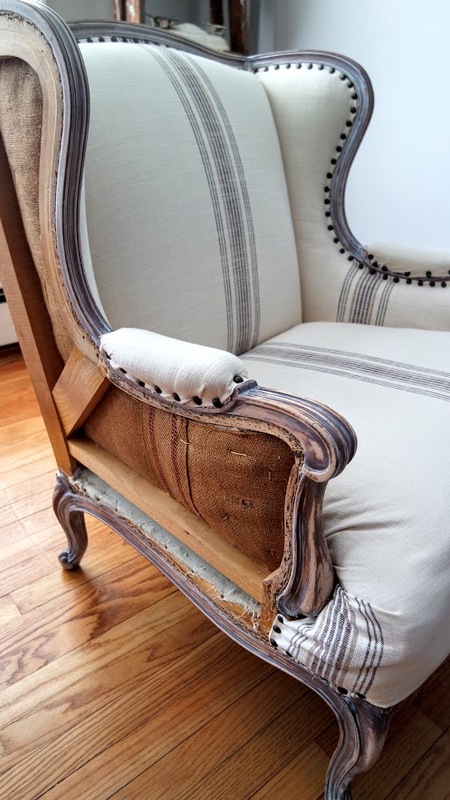 You can take a peek at the before pics of my chairs prior to deconstruction. 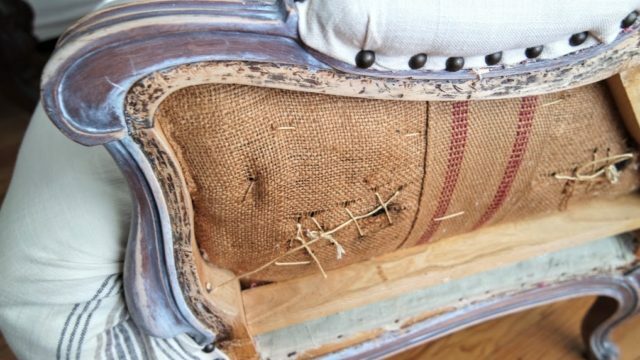 Needless to say, my husband and I were pleasantly surprised when we peeled back the five layers of upholstery to see that these beauties were not only well made but had all the character and charm I wanted to create. 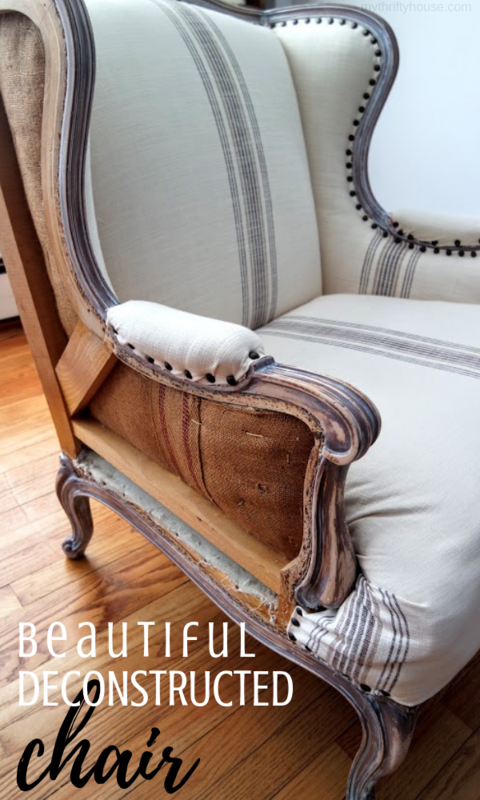 Gorgeous wood lines, burlap lining and patchwork stitches. I had originally planned to use drop cloth to cover the chairs but I scored an awesome deal at the thrift store. I picked up a brand new UGG duvet at the thrift store for less than $10. 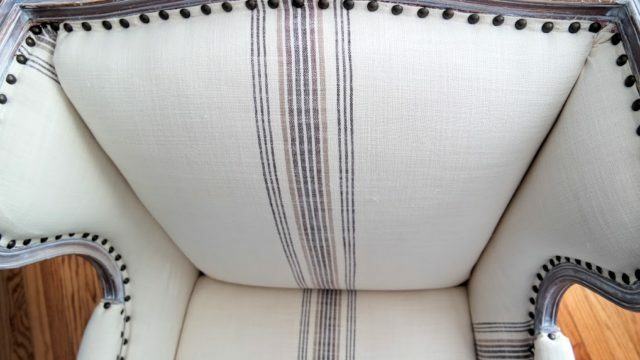 The material is a very heavy fabric that is cream colored, with farmhouse stripes and a linen look. Perfect for this deconstructed chair project. I am giving my husband full credit for this project as he painstakingly removed hundreds of staples. Not to mention, he put up with my endless “directions” and still loves me at the conclusion of the project. At the writing of this post, we have only completed one of the chairs and it has been well loved by the entire family. It has also become the favorite napping spot for our cat. And now you can see the before pics along with a —–> step by step tutorial of how we deconstructed the chair(s). Thanks for letting me tease you with this beautiful deconstructed chair. Please continue to scroll down and check out all the DIY goodness shared by my talented friends. 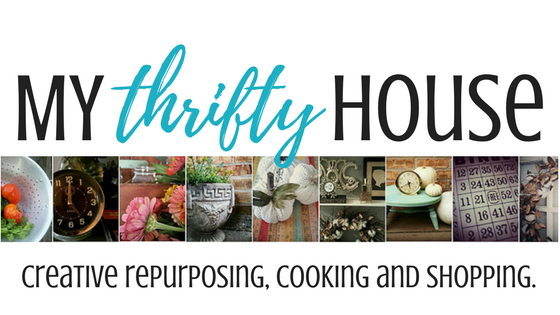 This entry was posted in Furniture Facelift, Thrift Store Decor Challenge. The chair looks great! Ahh your cat is so sweet, it’s the perfect napping spot. 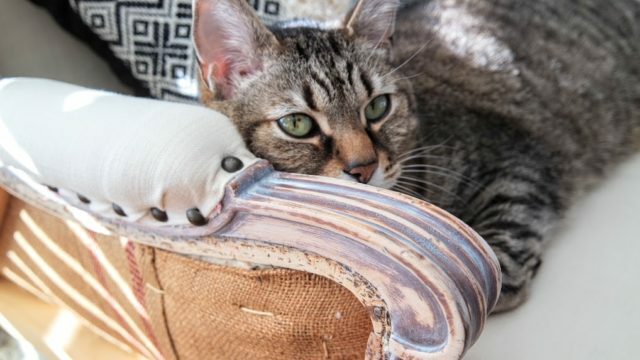 It is the perfect napping chair and the cat reminds me every time I walk in the room! Winner winner you need a chicken dinner! FAB!!!! Great job Denise! My jaw is still hanging at the fact that you scored that gorgeous fabric at a thrift store…amazing!! Me too! It was definitely one of my best thrift store scores and I debated for a long time if I should use the duvet on a bed or cut it up for the chair. So glad I went with the chair option. What a score on that fabric! I love the deconstructed look as well. You have me motivated to tackle my upholstered chair project. OMG Denise! This is so beautiful!! I admire your hard work! It’s gorgeous. Thank you, Emy. My hubby gets all the credit for executing my vision. This turned out great! I have heard of this technique but don’t see it often! Wow! 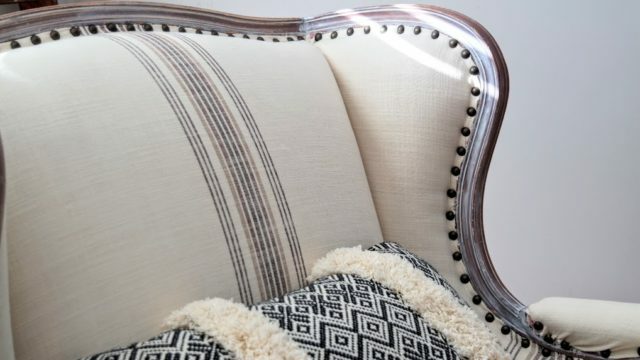 I love every detail–it’s gorgeous!Thanks for sharing at Vintage Charm–pinning! You know how much I LOVE this!!! Love the fabric you chose!! Thanks so much, Sam Great place to sit and chat with a cup of coffee or tea. Hint, Hint! Pingback: Waste Not Wednesday 149 - Of Faeries & Fauna Craft Co.
Wow! This is gorgeous! I love the crisp white front followed by a very streamlined deconstruction. Such a beautiful chair!